1. I got one of these cutie little macaroon boxes for Christmas (I guess my husband really does read my blog) and its the perfect resting place for my rings at night. All the colors are adorable! 2. Who doesn't love brass these days? My hideous 80's shiny brass bathroom light fixture might not look so hideous if my eyes could focus on this soap pump and not the light fixture. 3. Needlepoint and leopard. No more words needed. 4. I am CRAVING an office space of my own. I'm a bit ADD when it comes to picking out a desk for myself and I'm loving this one today. Tomorrow it might be a new one though. 5. How fun would it be to host a backyard BBQ and bring out these bad boys to serve lunch on? Those macaroon boxes! Love that. What an attentive husband you have! Love the Macaroons! I need that! kudos to your hubby -- those boxes are adorable! What a cool soap dispenser! I too get distracted with amazing finds. Amazon universal wish list and Pinterest keep them all saved for me! 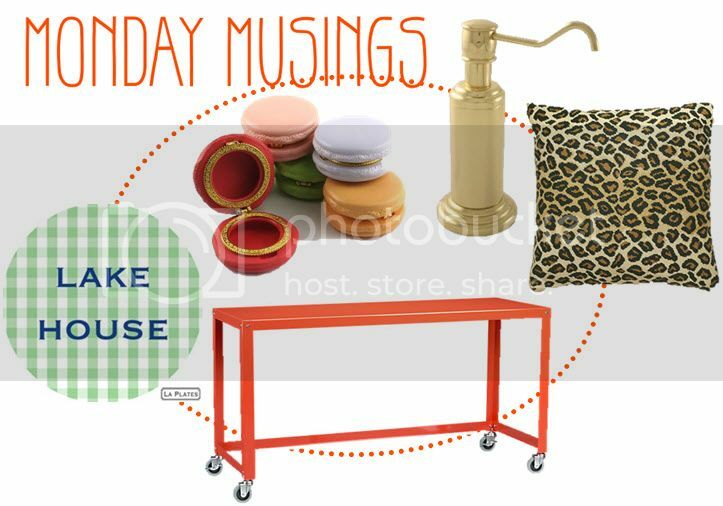 I love love love your musings today! Especially that table! Leopard needlepoint...agree, no words. I could kill a day in noting flat just clicking around.